DagDok is your guide to UN and UN documentation and helps you to find UN documents and reports. 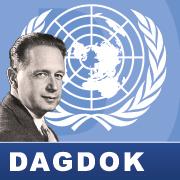 DagDok is a guide to the UN documentation by the Dag Hammarskjöld and Law library, Uppsala University. Its purpose is to help you find UN reports and documents as well as background information about the UN organization as well as areas of UN activity. Dag Hammarskjöld library, New York, has made a short video about 70 years of Human Rights. More on UN and the human rights in DagDok.